Deniss Vasiļjevs of Latvia performs his short program at the 2015 World Junior Figure Skating Championships. When Latvian skater Deniss Vasiljevs performed at the 2015 ISU World Junior Championships earlier this year in Tallinn, Estonia, he was awarded by lots of applause and cheers by the spectators. While he didn’t win a medal, he finished a respectable seventh out of the 24 competitors who qualified for the free skate. The 15-year-old enjoyed similar success last year in his debut at the World Junior Championships in Sofia, Bulgaria, where he placed eighth. Aside from his two Junior Grand Prix (JGP) events, he also placed first at the junior level in a whopping five international competitions that season. The two-time Latvian Junior champion easily connects with the audience and stands out as a real entertainer on the ice—a rare quality for a skater of his age. When talking to Vasiljevs, you realize quickly that he has an appealing and interesting personality off the ice as well. Other young skaters are often shy when they have to perform in front of judges and an audience, however, this is not the case with Vasiljevs. The athlete from Daugavpils, Latvia’s second biggest city in the southeast of the country, is satisfied with how his season went. Vasiljevs’ head coach is Lithuanian Ingrida Snieškienė, who mainly lives near Paris with her family, and so the skater splits his time between Latvia and France. Russia was added to the mix as the 1994 Olympic Champion Alexei Urmanov joined his coaching team earlier this year. “I am a rolling stone,” Vasiljevs noted with a grin. “I’m skating a bit here, there and there.” The teen proudly added that he began travelling alone from his hometown to Paris at the tender age of nine. Vasiljevs, who took up the sport of skating when he was three or four, says it was just coincidence that he got into the sport. Opposite the pool, however, was an ice rink. Coaches, in any sport, are generally able to recognize talented children early on. “The first time I went to (Junior) Worlds (in 2014) I cried, because I was afraid not to make the final,” admitted her student. Obviously, there was no need to worry. Not only did Vasiljevs make the top ten, he impressed ISU officials so much that they awarded him the ISU development stipend a few months later. 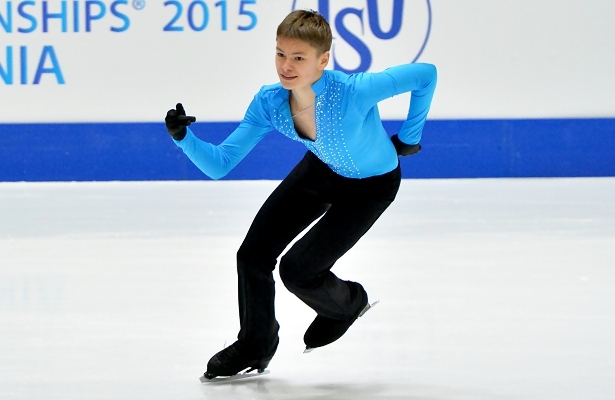 Vasiljevs’ first memory of skating is collecting chestnuts on the ice. Vasiljevs already actively takes part in the process of building the programs. For example, he created two interesting positions in his spins. He looks up to Canada’s Patrick Chan, Japan’s Daisuke Takahashi and Spain’s Javier Fernandez. Off the ice, the Latvian Junior champion is a diligent student, studying in ninth grade in his hometown. Currently, he is busy in school with his exams. He enjoys drawing and is interested in military history and combines his interests by drawing detailed pictures of historic armies. “I think these two qualities are very important for any person and he has them,” said the coach. “He is also a very kind, good-natured person.” Indeed, he comes across as very amicable and has a genuine, open smile. Once the exams are done, the skater hopes to see Snieškienė and build a new short program. Next month, he will join Urmanov in Sochi and train with him during the summer. For the upcoming season, Vasiljevs wants to master the triple Axel that he has worked on, but not yet landed in competition. His team decided not to attempt it this past season. While the he wants to get a new short, Vasiljevs will keep his “Tron” free skating to the soundtrack by Daft Punk that was choreographed for him by former French ice dancer Benoît Richaud. The plan is to start the season on the JGP and to debut at the European and World Figure Skating Championships.